Wuzhishan Pigs are small pigs raised only in the isolated tropical mountainous region of the Hainan province of China. Very few people in this region raise this breed for production purposes because of the fast introduction of exotic species. And Wuzhishan Pigs are not used as a market supply animal, but only by local farmers for self-consumption. Together this is leading to Wuzhishan Pigs becoming rare. Wuzhishan pigs are black, with a white abdomen and inner leg area. They have long legs, long and tipped snout, level back and loin, small head, and narrow chest. 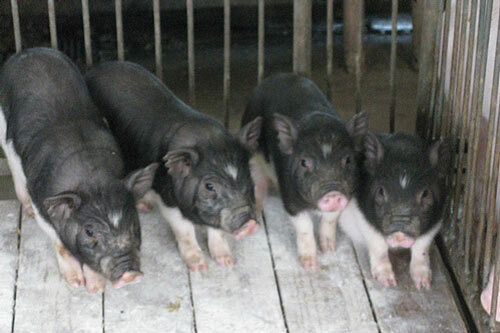 Sows grow to be about 50 to 70 cm long, 35 to 45 cm high, 65 to 80 cm around the chest, and 30 to 35 kg in weight. Sows are able to give birth 1 or 2 times a year, with first pregnancy occurring at the age of 3 to 4 months. Boars first become sexually active at 1 to 1.5 months.